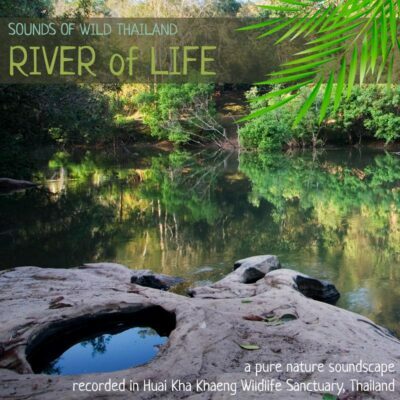 A nature soundscape album featuring the sounds of birds and wildlife in the forests of western Thailand. 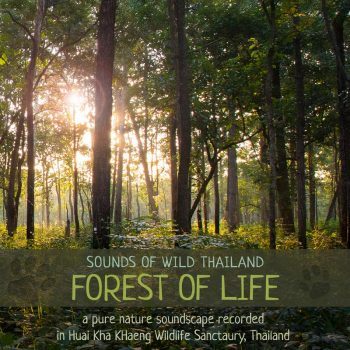 This album is the third in the series ‘Sounds of Wild Thailand’ and features the vibrant sounds of Huai Kha Khaeng’s forests from dawn until dusk. 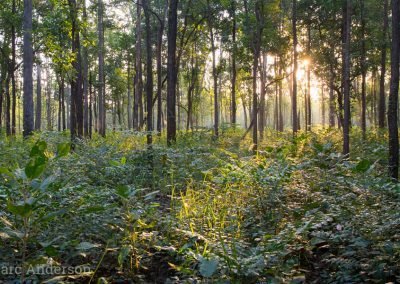 Dawn breaks in the forest, with various bird species becoming active as the light brightens. 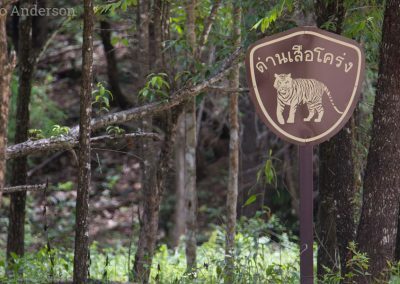 Crickets trill, and an Asian Barred Owlet calls occasionally along with Sooty-headed Bulbuls, Black-hooded Oriole, Lineated Barbet and a White-rumped Shama. A party of White-crested Laughingthrush move through the undergrowth near the microphones. 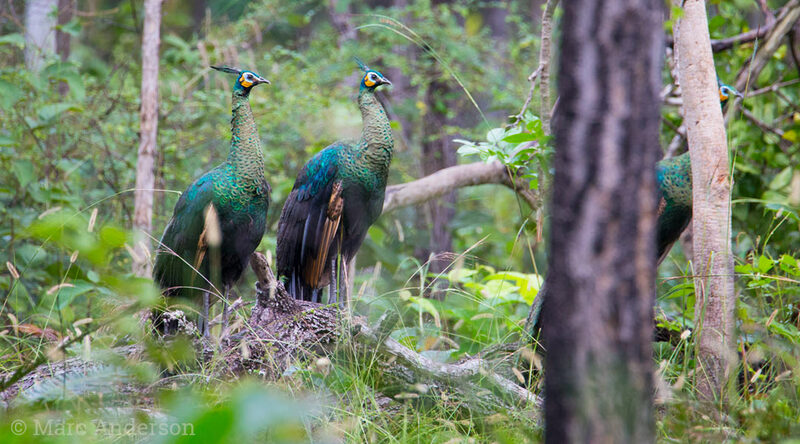 The soft bubbly call of a Rufous Treepie can be heard during the first couple of minutes of this track, and the loud mournful cries of the endangered Green Peafowl ring through the forest. 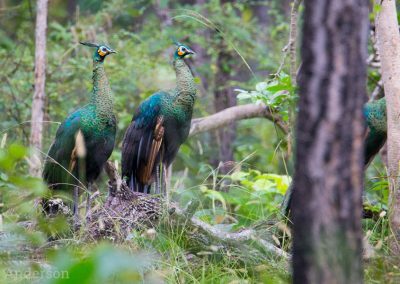 Other birds start to sing as the day warms up including Greater Racket-tailed Drongo, Puff-throated Babbler, Red-billed Blue Magpie and Changeable Hawk-eagle. Frogs occasionally call from a nearby marsh. 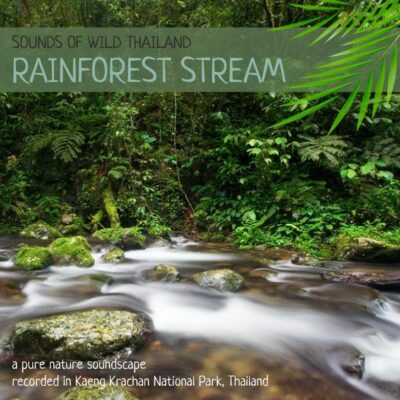 Moving into a forested evergreen gully, if you listen carefully on this track you can the delicate sound on water trickling in a small creek nearby. 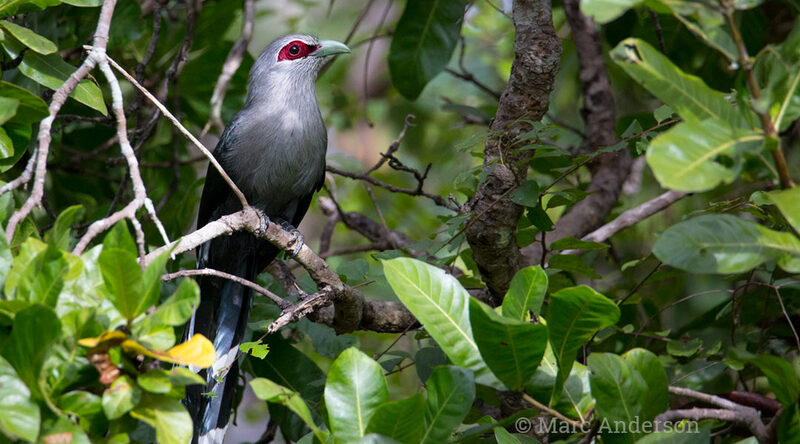 A Red-billed Blue Magpie squawks noisily at it flies off at the start of the track, and Lineated Barbets call throughout. Red-breasted Parrots call and fly about overhead, and White-handed Gibbons sing in the far distance. The second half of this track is particularly calm and peaceful, as most birds have started to settle in the heat of the day. Afternoon in the deciduous forest, and the track begins with a disgruntled squeal from a Wild Boar! Black-hooded Orioles sing with melodious fluty whistles, and a Red Turtle Dove makes rolling cooing calls from a nearby tree. Bulbuls, White-crested Laughingthrush, White-bellied Woodpecker, Green Peafowl & Greater Coucal can all be heard on this track. 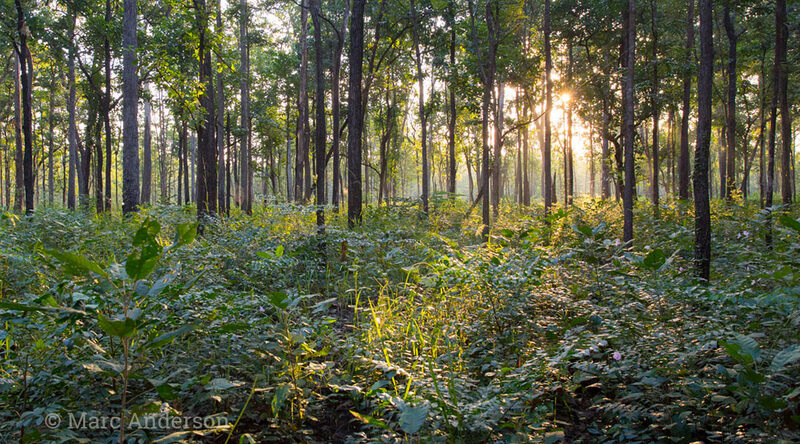 The warm afternoon light fills the forest as Black-hooded Orioles continue to sing. 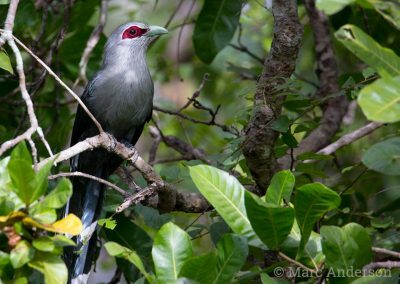 White-crested Laughingthrush move through the forest and a Black Giant Squirrel makes it’s loud staccato call from the canopy above. Close to sunset and much of the forest is in shadow. A Brown Wood Owl hoots in the fading light, while a number of diurnal birds are still active. A Tickell’s Blue Flycatcher sings sweet wispy melodies from the undergrowth, an and Asian Golden Jackal howls mournfully. The final track of the album was recorded deep in the wildlife sanctuary and features the distant roars of a female Indochinese tiger. Three distinct roar sequences can be heard, although two of them are quite soft (the first starts at approximately 12 seconds, the second at 3:18 & the third and loudest is at 6:05). If you’re listening on a mobile device or laptop, you might need to put on some headphones to appreciate this amazing sound! A Brown Hawk Owl makes the constant tu-woop call during this track, as a Brown Wood Owl hoots occasionally. A Common Muntjac (or Barking Deer) can be heard ‘barking’ between 2:50 & 5:50. 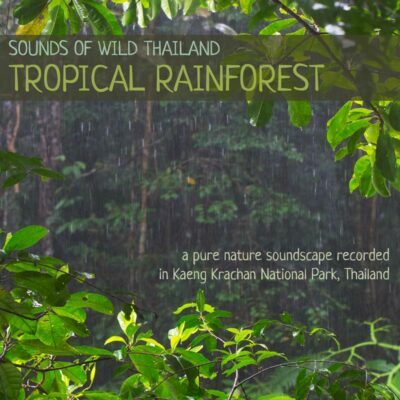 Green Peafowl, Red-wattled Lapwing, Changeable Hawk-eagle, Red-breasted Parakeet, Greater Coucal, Red & Spotted Turtle Doves, Asian Barred Owlet, Brown Wood Owl, Black-headed Woodpecker, Lineated Barbet, Black-hooded Oriole, Rufous Treepie, Red-billed Blue Magpie, White-crested Laughingthrush, Sooty-headed Bulbul, Black-naped Monarch, Tickell’s Blue-flycatcher and more…. 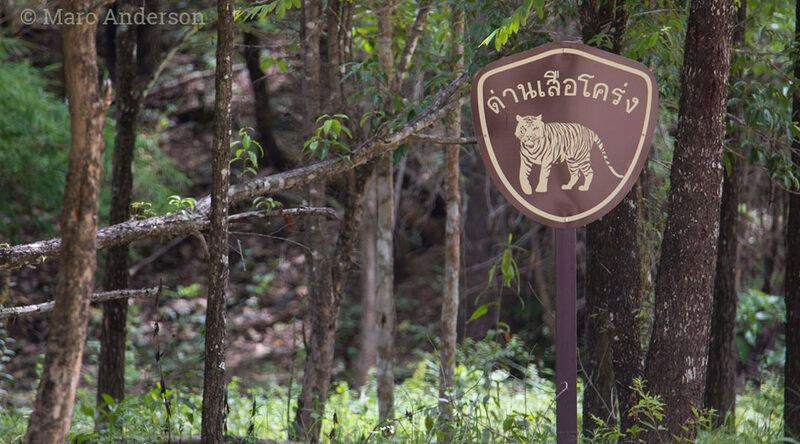 Mammal species recorded include: Wild Boar, Barking Deer (Common Muntjac), Thai Golden Jackal and Indochinese Tiger.